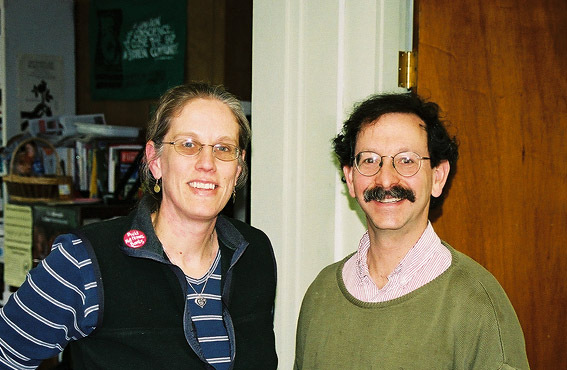 Concord, NH, May 23, 2003--Cathy Haigh, Presidential Primary Project Coordinator, and Arnold Alpert, AFSC-New Hampshire Program Coordinator, in their offices. Q: Talk a bit about your work here; when did you start and what are you doing? I've been doing it since January, and it's sponsored by both New Hampshire AFSC, which is the American Friends Service Committee and New Hampshire Peace Action, so it's sort of a joint project between the two of them. My position actually was originally called Bird Dog Coordinator, but we've sort of adjusted that just a little bit to Presidential Primary Project Coordinator. Q: Didn't look good on the business cards? I just wasn't sure I was going to put that on a resume, but anyway--and also, I don't know, it seems a little more legitimate to call it that. In that time we've held I think three or four workshops on how to be a bird dog, talking to people about different issues. We've targeted three issues and those are foreign policy, specifically disarmament and the Bush Doctrine; trade policy, specifically concerns about the FTAA, NAFTA as well; and affordable housing. Those are our three issues. So what I do is I sort of track the candidates, figure out what they're doing...and I send out weekly bulletins to everybody that's on our list; we have three or four different e-mail lists...and we send out updates weekly as to where they are. We have talking points and specific questions for the candidates, which actually are on the web site, and our goal is to just keep asking the same question over and over and over again, hoping that the media is going to pick that up as well as the candidates will start mentioning things like housing in their stump speech. I saw Senator Kerry a couple of days ago and twice without being prompted he mentioned housing. So if that happens, then we're really happy. We're just sort of raising the awareness and the amount of time and energy that's spent on those, and getting them actually to have a position, yes I support the trust fund initiative, those sorts of things. Q: Have you done this kind of work before? I have not. I was actually fiscal agent for a state Senate campaign last election cycle, here in New Hampshire, my first foray into politics. But this is a part-time position. I have another part-time position in an affordable housing organization in Concord. So housing is sort of my shtick. Q: What have you learned; are there things that you've kind of had to adjust as you go into this? ...I'm finding some campaigns are more forthcoming about what they're doing than others. For example the Lieberman campaign really isn't interested in telling us what they're doing, but the Kucinich campaign wants lots of people to be there so they're very forthcoming as well as the Dean campaign and the Graham campaign. So I'm finding that the sort of the less knowns are a little bit more willing to let me know what they're doing. We know that as time goes by they're going to be less public, less willing to share information, so we're really trying to crunch it here through the summer before they really become less accessible. Q: Anything else you've learned? I've learned more about how to be a bird dog. I think that I have been a bird dog for a number of years and didn't realize that's what I was doing and the positive effect of asking particular questions and how it does become part of their stump speech and what they talk about if you do keep asking the questions over and over again, but it takes a lot of dedication, a lot of people doing it over and over. People are thirsty for this kind of thing. I think that we are primed for a change, but they're also looking for guidance. This is totally nonpartisan. We're not ever going to say vote for Lieberman or vote for Dean or vote for Graham, but we are going to say Lieberman voted this way on this bill and Graham is saying this and Dean says this. We're here to educate and think that's a really powerful tool.